Insurance, and the price you pay for it, is based on risk, if you appear to an insurance company to be a risky consumer, your rates will increase. You want to keep your risks low by keeping your claims history minimal. Of course, insurance is there to protect you, but the key is to use it wisely. If it’s not obvious, it may be worth thinking twice. Obvious damage includes a completely damaged car, a home fire, or robbery, but what about a dent in your door, or a cracked windshield? If the repair amount is less than your deductible, it's probably not worth filing a claim. However, when someone is injured it is necessary to file a claim regardless of how minor the injury is. When you hear the screech of tires, it's too late to review your policy and change your coverage. Be ready ahead of time, so you are covered before that rush of adrenalin followed by the bang and crash of a collision. Have your insurance card with you; understand your policy, your rights, and what you are covered for. Keep basic emergency supplies on hand to take care of yourself and your family in case of a disaster. Be prepared in your home and your car so you can work quickly and efficiently when tragedy strikes. Even if you're not sure you want to file a claim, contact your insurance company and discuss the options with them. Your policy requires you to report your claims promptly so the company can control the claim. If you don’t, they can deny coverage if you decide to file a claim later. If possible, avoid calling a 1-800 number and call the person you know, the office you have been to, and the individual you have worked with to purchase the policy. It is important to take pictures, video, and document information both before and after a catastrophe. Being able to provide both sides of the story can help insurers to understand the extent of the damage. Create a home inventory, take pictures of your car, your belongings, and keep this inventory up to date to use as a reference. The claims process will go much smoother if your insurance company knows exactly what happened in the course of the accident. Drivers should do everything they can to get the names and addresses of all drivers and passengers involved in the accident including insurance information and license plate numbers. Take note of the make and model of each car and driver’s license numbers of all the drivers if possible. Look around for witnesses, get their names, and contact information. Ask the police for their names and badge numbers so you know who you spoke with and who was present at the time. Auto insurance fraud is not something you want on your record. If you know you made a mistake, if you know it was your fault, it’s better to fess up than face the consequences. If you face a rate increase, search for a different car insurance company. Document everything you can. Take pictures or video of your home, car, or business. Get information from anyone else involved. Get names, phone numbers, and insurance information of others involved. Make a timeline of events. Anything you can do to create a clear and honest picture for the insurance company. The insurance claim process can seem complicated, and it only gets more frustrating when you don't get quite as much money as you were hoping. Use these tips to get the most out of any insurance claim. 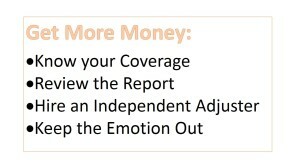 For many consumers, they end up being underpaid on claims because they do not understand their coverage. Keep past statements, and annual reviews on hand so you can refer to them if necessary. If you do not have a copy of your policy, request that your representative send you a full copy of your coverage and review it before accepting anything. The adjuster's report is more than just the fine print, be proactive and ask for a copy of this report. The adjuster is most likely going to use a computer program to prepare costs based on averages, so it’s important to have your own evidence for materials or property that has an above-average price tag. Look through the report for things such as missing items, partial or incomplete measurements, and low-balled contractors costs. Don't accept any payment until you agree with the adjuster's report. When you are faced with a catastrophe whether it be a flooded basement, a rollover accident, or a fire that destroyed everything, most individuals are emotional, upset, and are ready to cut their losses and move on. Insurance companies know this, if necessary, ask family or friends to help you with the insurance process so you can keep a level head. There is no reason to live with a leaky roof while you are waiting for the insurance company to make a move. In fact, if you fail to make temporary repairs, and the damage gets worse, the insurance company may actually deny you coverage based on your neglect. 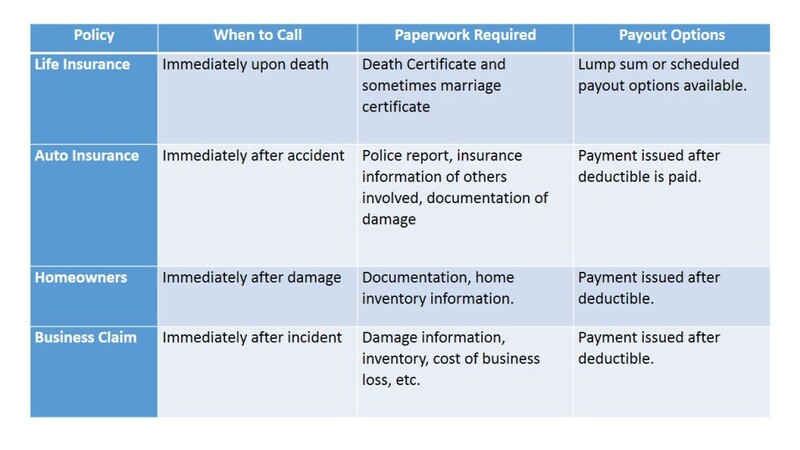 Save all receipts and documentation, as the insurer will likely reimburse most of these expenses. Another option is to hire your own adjuster, who will act independently of one provided by the insurance company and give you a fair assessment of your damage. It is hard for an insurance company to deny the report of a hired professional. If you find yourself in an insurance battle, you can hire an attorney who will fight your fight for you. Many attorneys and public adjusters work on a contingency basis and you will sign over a percentage of your payment to them, however, this may still get you more money than you could get on your own. 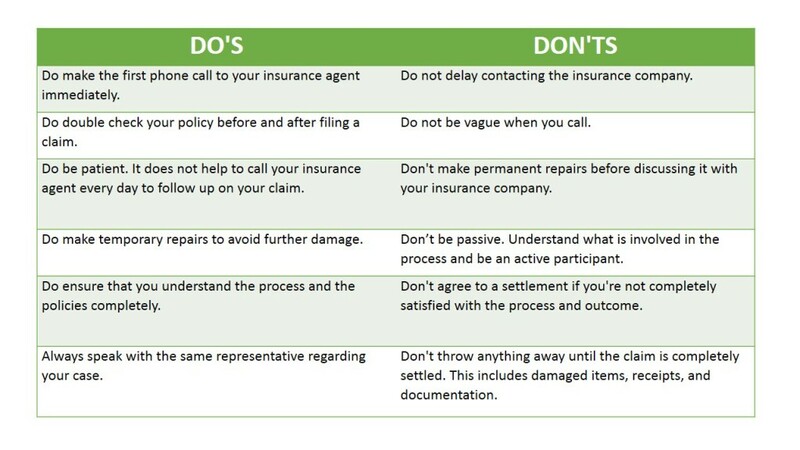 Regardless of the type of insurance claim you are filing, there are a few definitive do's and don'ts of the process to ensure you get a fair settlement. We all hope that we will never have to use our insurance policies. We carry homeowners, auto, and medical insurance to protect against disaster, but we hope that disaster never comes. When the unthinkable happens, having insurance is the silver lining that makes things right again. However, not every claims process goes smoothly. If you become frustrated with how your claim is being handled, speak directly to your agent, explain the situation, and ask about possibly remedies. If necessary, contact the customer service or claims department to get more information about your specific claim and what steps may be taken. If all other measures fail, voice your displeasure to your state’s department of insurance for assistance.